While the retail sector struggled, Britain’s managed pub and restaurant companies had cause to celebrate over the six-week Christmas and New Year period with collective like-for-like sales up a healthy 4.1% on 2017, according to latest figures from the Coffer Peach Business Tracker. Both pub and restaurant operators saw positive sales growth over the festive season, with pubs enjoying the biggest uplift with collective like-for-likes ahead 5.1% against a 2.4% increase for restaurants. London also benefited more than the rest of Britain, with like-for-likes over the six weeks to January 6 up 5.0% compared to 3.8% outside the M25. “This is all in stark contrast to the gloom hanging over retail, which according to the British Retail Consortium suffered its worst Christmas for a decade with zero sales growth,” said Karl Chessell, director of CGA, the business insight consultancy that produces the Tracker, in partnership with The Coffer Group and RSM. “What these Tracker figures suggest is that consumers are being more selective about where they spend their money, and are looking for memorable experiences – like going out for a meal or drink with family or friends over Christmas – rather than just buying ‘things’,” added Chessell. Drink sales were the major driver of growth in pubs over the period, up 6.4% on last year compared to a 3.6% rise in food sales, the Tracker figures show. “Premiumisation will be a big part of that, and trading-up appears to have helped restaurants too, as the number of covers served rose only 1.3% from last year,” Karl Chessell observed. 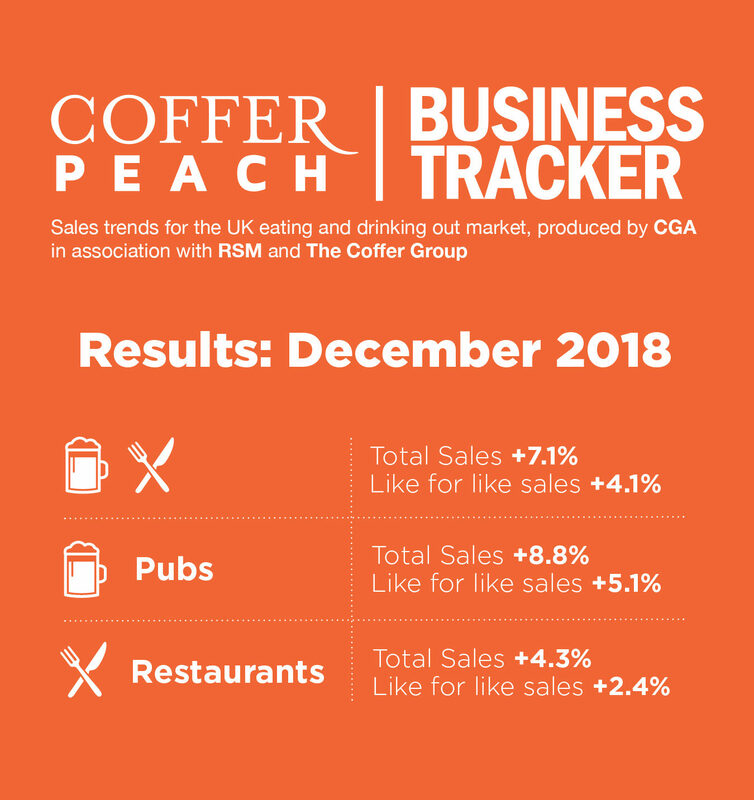 The Coffer Peach Tracker industry sales monitor for the UK pub, bar and restaurant sector collects and analyses performance data from 49 operating groups, with a combined turnover of over £9bn, and is the established industry benchmark. CGA Peach collects sales figures directly 49 leading companies. Participants include Mitchells & Butlers (owner of Harvester, Toby, Miller & Carter, All Bar One etc), Pizza Hut, Whitbread (Beefeater, Brewers Fayre, Table Table), Pizza Express, The Restaurant Group (Frankie & Bennys, Chiquitos, Brunning & Price), Spirit Group (Chef & Brewer, Flaming Grill, Fayre & Square), Casual Dining Group (Café Rouge, Bella Italia, Las Iguanas), Stonegate (Slug & Lettuce, Yates’, Walkabout), Deltic, TGI Fridays, Marston’s, Azzurri Restaurants (Zizzi, ASK), Wagamama, YO! Sushi, Prezzo, Fuller’s, Carluccio’s, Young’s, Living Ventures, The Alchemist, Gusto, Strada, Amber Taverns, Hall & Woodhouse, Gaucho, Giraffe, Loungers, Byron, New World Trading Co, Peach Pub Co, Le Bistrot Pierre, Laine Pub Co, All Star Lanes, Le Pain Quotidien, Fazenda, Liberation Group, Wadworth, Honest Burgers, The Snug Bar, Downing LLP (investment partner of Antic London), Bermondsey Pub Company, Revolution Bars Group, Polpo, Bill’s, McMullen & Sons, Coaching Inns Group, Rileys Sports Bars and Mowgli.